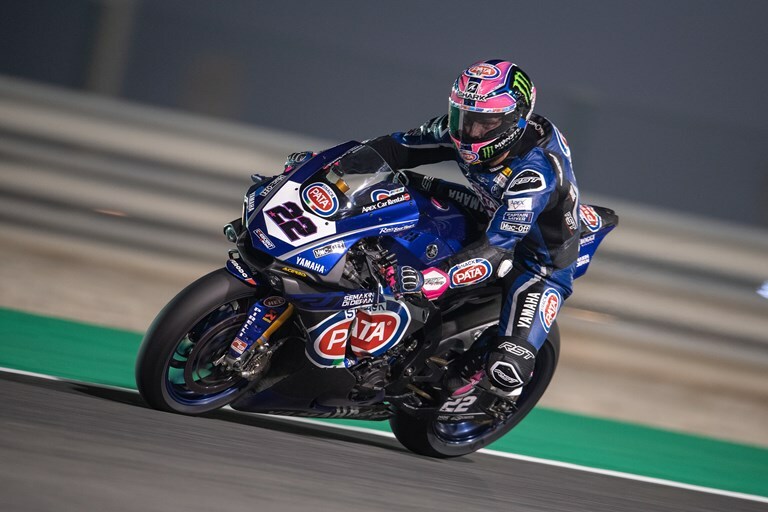 Pata Yamaha Official WorldSBK Team rider Alex Lowes stormed his way to third place and his fourth podium finish of the season in today’s thrilling WorldSBK encounter, run over 17-laps under the floodlights at the Losail International Circuit in Qatar. Michael van der Mark brought his Yamaha YZF-R1 home in seventh position to pick up vital championship points, despite experiencing some pain in the latter stages of the race from the injury to his left wrist sustained in his FP1 crash yesterday. Lowes, who lined up on the front row of the grid after a superb Superpole performance saw him qualify in third place, got a good start and was immediately embroiled in a titanic battle for third and the final podium spot with Eugene Laverty. Laverty took the early advantage but the Pata Yamaha rider struck back to reclaim third place on lap seven, only for the Irishman to demote him back to fourth again two laps later. The positions remained the same for most of the second half of the as both riders started struggling for grip, Laverty with the front and Lowes with the rear. On the final lap Lowes made his move, fighting his way past Laverty in a fierce battle and then holding the Irishman off to the line to secure his fourth podium finish of the season in third place. Van der Mark endured a tough opening race in Qatar today, having missed out on set-up time due to a crash in the early stages of FP1 that left him nursing a painful left wrist injury. The Pata Yamaha rider got a good start from the third row of the grid, but was unable to make up places on the opening laps as he struggled to finish the corners. Despite experiencing some pain in his wrist towards the end of the race, van der Mark managed to maintain contact with the battle for sixth position that was being fought out ahead of him. As he crossed the line to start the final lap both Chaz Davies and Xavi Fores slowed unexpectedly, allowing van der Mark through into seventh position, which he held to the chequered flag. The Pata Yamaha rider remains third in the championship standings, but is now just 23 points behind second-placed Davies. The final race of the 2018 FIM World Superbike Championship takes place tomorrow, with lights out at the Losail International Circuit scheduled for 19.00 local time.